There are some times, they are rare and they are brief but they happen, when the horizon between heaven and earth melts away and the future is changed forever. It is often those who have suffered the most who experience such revelations. Their gifts are a profound peace, the knowledge that all will be well, and total clarity about the course they must follow. I am sure that it was just such an experience that led a young man from a desperately poor background to create the world’s most popular Christmas carol. A carol which caused soldiers to come out of their trenches one Christmas Eve during World War One to share rations and gifts with the ‘enemy’ and even play a game of football together! It was Joseph Mohr who wrote the words to Stille Nacht, (Silent Night). He had a very inauspicious start to his life. Born in Salzburg in 1792, he grew up poor and fatherless. His godfather was the local executioner and his mother knitted to make a living. But Joseph was a special boy. He sang in the church choir and had a gift for music and poetry. These talents were recognised and encouraged by the local priest who helped Joseph through school, on to university, then to work as a curate, and ultimately to train as a priest. But times were hard in Europe during his early years. As well as natural disasters such as flooding, which destroyed livelihoods and infrastructure; the Napoleonic Wars had seen Salzburg and the surrounding towns and villages devastated, occupied, bombarded, defeated and heavily taxed. The ordinary people were suffering in 1816 when Joseph Mohr found consolation in the church at Mariapfarr. There he was inspired to write the words to his carol. 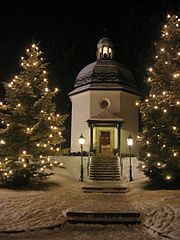 It would be two more years before the carol was set to music by Joseph’s friend, the organist and choir director, Franz Gruber in Oberndorf. They sang the carol together in German at midnight mass with guitars for accompaniment. The aim was to bring the Christmas spirit of love, peace, comfort and joy to their community in these difficult times. They surely succeeded then and ever since. Joseph Mohr died penniless in 1848, having used all his earnings to provide education for the young and care for the elderly in his parish. He would never know that his little carol would travel the world being performed over and over again. It would be translated into over 300 languages and become the people’s favourite Christmas carol nearly 200 years after it was written. Now that is a legacy to be proud of! This entry was posted in Creativity, Musings, Poetry, Spirituality and tagged Silent Night. Bookmark the permalink. Thanks for this – I was born near where the song originated. 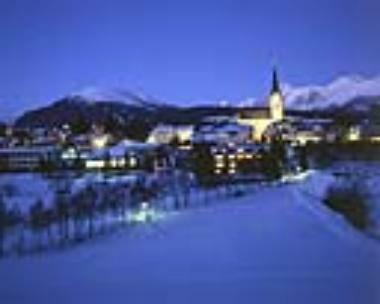 I still fall silent and remember the many Christmasses I spent in Bavaria during my youth – the only way this song should be performed is with guitar accompaniment, the way Joseph Mohr and Franz Gruber performed it originally. It continues to be the most humbling songs of the season. Your writing is beautiful! Oh thank you Anna what a wonderful comment x and what a beautiful place to be born! Beautiful post that reminds me that sharing our light and talents in the world matters in ways that we may never see in our lifetine. So true Karen, its a beautiful story.